Yet an other bugfix release of Mixxx 2.1. - Add support-in-principle for authenticating using ECDSA or Ed25519 keys; this also requires a sufficient version of Twisted (which at the time of writing supports ECDSA but not Ed25519) and support in the Launchpad authserver. SIESTA is both a method and its computer program implementation, to perform efficient electronic structure calculations and ab initio molecular dynamics simulations of molecules and solids. SIESTA's efficiency stems from the use of strictly localized basis sets and from the implementation of linear-scaling algorithms which can be applied to suitable systems. A very important feature of the code is that its accuracy and cost can be tuned in a wide range, from quick exploratory calculations to highly accurate simulations matching the quality of other approaches, such as plane-wave and all-electron methods. Latest stable release: https://launchpad.net/siesta/4.0/4.0.1/+download/siesta-4.0.1.tar.gz Guide to versions: 4.0: Stable series, appropriate for most users. 4.1: Series with new features (LDA+U, Spin-orbit, new TranSiesta/TBTrans...) *Beta version* trunk: Development series, subject to instabilities as new features are added. Improvements to PSML interface, including full spin-orbit interaction. Please see README_PSML and 000_INSTALL. + Bug fixes applied to the trunk since Nov. 2017. What's new in version 0.3.4.26? - Replaced the text button with Go! instead of Go. - The minimum version to install Subcon is now set to Chrome OS 64. - Renamed config.js to Subspace.js. Multiple exploitable remote command injection vulnerabilities exist in the MySQL Master-Master Replication Manager (MMM) mmm_agentd daemon 2.2.1. mmm_agentd commonly runs with root privileges and does not require authentication by default. A specially crafted MMM protocol message can cause a shell command injection resulting in arbitrary command execution with the privileges of the mmm_agentd process. An attacker that can initiate a TCP session with mmm_agentd can trigger these vulnerabilities. This module provides a way to securely storing passwords and other secrets. It uses DBus Secret Service API that is supported by GNOME Keyring (>= 2.30) and KWallet (>= 4.8). It allows to create new passwords, delete and search for passwords matching given attributes. It also supports graphical prompts when unlocking is needed. AFS is a distributed filesystem product, pioneered at Carnegie Mellon University and supported and developed as a product by Transarc Corporation (now IBM Pittsburgh Labs). It offers a client-server architecture for file sharing, providing location independence, scalability and transparent migration capabilities for data. IBM branched the source of the AFS product, and made a copy of the source available for community development and maintenance. They called the release OpenAFS. Catfish is a GTK+ search utility written in python. It's search is powered by find and locate, with search suggestions provided by zeitgeist. Mugshot allows you to easily update personal user details. This includes: Linux profile image: ~/.face User details stored in /etc/passwd (used by finger) Pidgin buddy icon LibreOffice user details Additional apps may be added in the future. SGT Puzzle Launcher (sgt-launcher) is a GTK+ 3 launcher application for Simon Tatham's Portable Puzzle Collection. The launcher embeds each game into it's window and wraps game functionality into the UI to make for an improved experience. Titania is a X3D/VRML editor and browser for Ubuntu. The goal is a full standard compliant X3D browser for future releases of Ubuntu. For now, Titania fully supports the Moving Worlds specification for VRML 2.0 and already many parts of the X3D specification. It can be used as a simple 3D viewer for .x3d/.x3dv files, as high quality 3D animation rendering engine, for advanced science simulations, live data visualization, or as easy to use gaming engine. Furthermore this package includes x3dtidy, an easy to use X3D/VRML beautifier. Added basic show/hide grid feature. Added input dialog for setting Opacity to control the opacity level. Updated the language restart button to be wide enough for FR translation. Fixed the Colour Picker missing the cursor icon. Fixed opening files with the File Manager. This release makes the prompt a lot more resilient against accidental key presses by only accepting numerical answers and ignoring the rest. New translations & a switch to the more modern PyQt5. Code of Conduct Signing Assistant is an open source program that helps you sign the Ubuntu Code of Conduct easily! No more worries about PGP keys or decrypting mail: just follow the steps the Code of Conduct Signing Assistant guides you through and in the end you have signed the Ubuntu Code of Conduct! Added Duplicate feature to the Image menu. Added Purge Clipboard feature to the Edit menu. Added Purge History feature to the Edit menu. Added Colour Threshold feature to Filter menu. Added select all feature to Selection menu. Added remember last opened folder for Batch Dialog. Added Paste as new image feature to the Edit menu. Updated appearance of Batch Dialog previews and file listing. Updated to use C++17 as the standard. Updated New file dialog to allow better keyboard navigation/usage. Fixed Print option allowed to execute without an image. Fixed pasted images disappearing after dragging with mouse. Fixed rectangle select shape missing icon. Fixed incorrect disabled state for undo/redo buttons with multiple images open. Fixed crash caused by clicking right click menu too early. Fixed crash caused by changing image mode without an image. Fixed being able to launch the canvas dialog without an image. Fixed the invalid file message appearing if you clicked cancel on the Open file dialog. 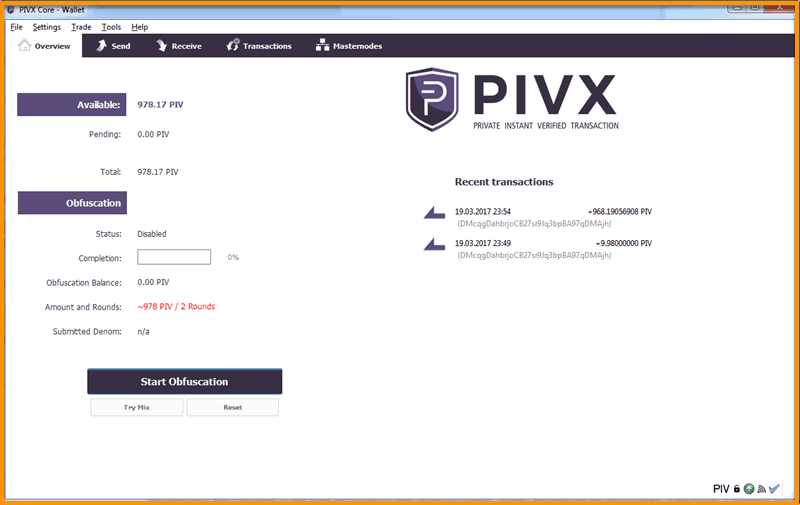 Firs PPA release of PIVX-Project wallet.